Well the fish have been in a week officially and seem really happy especially the past two days. I think the cheap flakes I had on hand were messing with them, or the too frequent water changes, or both. I changed their food to New Life Spectrum Small Fish food. I’m still dealing with a shadow of Ammonia readings on the test, just a faint green tinge, but I’m still in the process of dosing with Stability so I’m hoping the bacteria gets fully established in the next day or so. The tank has been planted for 10 days and I see good growth on all the plants now. I’ve ordered some tools to help me remove and plant the baby Java ferns before they get close enough to decide where to go themselves. 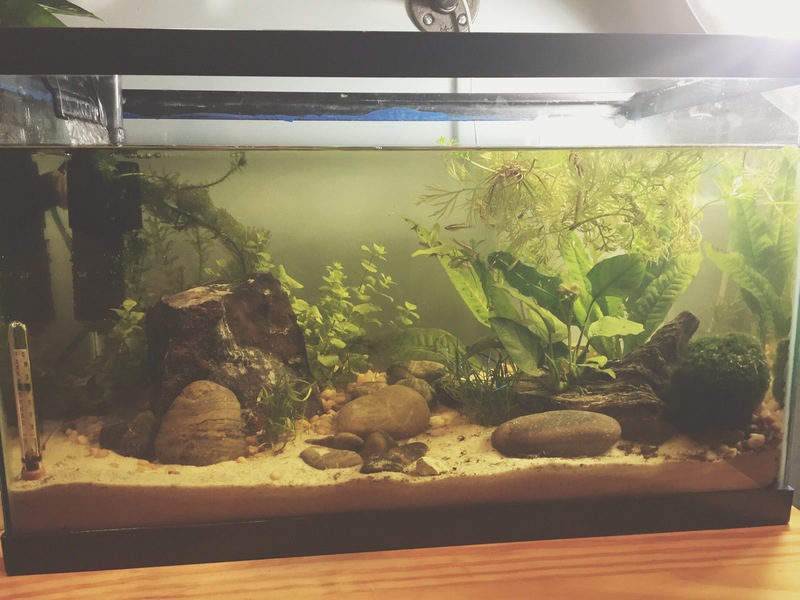 Obviously without the more frequent water changes, the tannins from the soil or the driftwood or both are majorly showing up, but that’s not hurting anything, and I’ve read they’ll eventually go away on their own. I’m not running the carbon filter or any activated charcoal, just the Seachem Matrix in the filter. Next Next post: Minnow fry!